July 22, 2018, Padum, Zanskar, J&K, India – This morning, under the scorching Zanskar sun, from which the shade of a ceremonial umbrella protected him, His Holiness the Dalai Lama walked from the New Phodrang to the pavilion at the head of the teaching ground. As is his wont, he stopped here and there to interact with members of the public. He briefly visited the temple that stands behind the teaching pavilion before stepping out to the front of the stage to greet the crowd of an estimated 16,000 people—monks and nuns, lay-people young and old, mostly Zanskaris, but including a few visitors from other parts of the world. The expressions on their faces varied from the seriously devotion to beaming smiles reflecting a genuine pleasure to see His Holiness before them. Girl students from the CBAC Branch School were avidly engaged in debate as His Holiness made his way to the throne and sat down. Tea was served as introductory prayers were recited. “I’m very happy to be here in Zanskar again,” His Holiness announced. “The monastics and general public continue to reveal an unflinching devotion and we have an opportunity once more to share a Dharma discourse. I’m also glad to have the chance to give you some advice. I’d like to thank the organizers and everyone working with them for making this possible. “Mr Namgyal here and the King of Zanskar have been friends for a long time. I’m pleased to see them again. “Wherever I go in the world, I explain that as human beings we are all the same. We all want happiness and don’t seek suffering. We have a sound intelligence capable of judging right from wrong. As followers of the Buddha we generate an altruistic attitude such that we pray for the welfare of beings in far off galaxies. However, we have no direct connection with them. Even on this earth, there are animals, birds, insects and fish who also wish for happiness, but there is little we can do to teach them. With human beings we can communicate. Our intelligence enables us to increase our happiness, but what’s particularly important is to do so on the basis of the mind, our sixth consciousness, rather than through our sensory faculties. His Holiness explained that his second commitment is to foster harmony and friendship among the world’s various religious traditions because they are all potentially beneficial to their followers. He spoke of friends who are Jains, Hindus, Jews, Christians and Muslims. He mentioned that today all the world’s major religious traditions flourish in India. Meanwhile, elsewhere in the world people are fighting and killing each other in the name of their faith. Since all these traditions teach love and compassion, tolerance and forgiveness, there should be friendship and respect among them. This is what His Holiness seeks to achieve. He noted that in Ladakh and Zanskar people are mostly Buddhist, but there are also Muslims and a few Christians here. Since all of them, and even those who have no particular faith, seek happiness, it’s necessary to live in friendship. We should see other human beings as our brothers and sisters. He remarked that there may be references in certain texts to ‘enemies of the Dharma’, but since it is their mental afflictions and disturbing emotions that make them so, they ought to be objects of compassion. Asking the Zanskari translator to give the gist of what he had been saying, His Holiness remarked on the importance of knowing Tibetan, especially being able to read Tibetan and the literature of the Kangyur and Tengyur that is written in it. He observed that at Nalanda there were representatives of all four Buddhist schools of thought. Bhavaviveka has written about these and other different philosophical points of view. However, there was no antagonism between them. In Tibet, Nyingmas teaching the breakthrough practice of the Great Perfection, Kagyus teaching Mahamudra, and Sakyas pointing out the indivisibility of samsara and nirvana, represented different approaches to the same goal. Sometimes, sadly, there was antagonism among these traditions. His Holiness made clear that if there is such antagonism between spiritual traditions in Ladakh, it’s time to give it up. 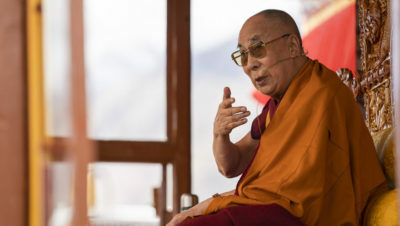 Clarifying that as a Tibetan, someone who bears the name Dalai Lama, his third commitment is to Tibet and the six million Tibetans who place their hopes in him, he declared, “I have proudly and happily given up the political responsibilities that Dalai Lamas have held since the Fifth. I have devolved them to an elected leadership. It’s not helpful for religious leaders to become too involved with political affairs. 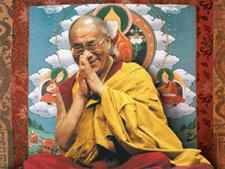 I am opposed to ‘Lama Politics’ that lead to a division of ‘us’ and ‘them’. If we meet again, I’ll repeat this to you—but if we don’t, this is my last wish to you. “As a Tibetan, I have a responsibility to preserve and promote Tibetan culture, not only in the interest of Tibetans, but to keep the Buddha’s teachings alive. This is something many Chinese are also interested in. “Then there is the question of protecting Tibet’s natural environment. It was a Chinese ecologist who recognised that the contribution of the Tibetan Plateau to the global climate was as significant as that of the North and South Poles. He renamed Tibet the Third Pole. Reduced snow and receding glaciers on the mountains mean water supplies will dry up. The land will become like the deserts of Afghanistan that you see when you fly from India to Europe. Therefore, trying to preserve Tibetan ecology is significant. “Relations between Tibet and China are not new. In 7th, 8th and 9th centuries there were close links between the Tibetan, Chinese and Mongolian Empires. Marriage alliances were formed. Later, during the time of Sakya rule, the Priest-Patron relationship was established. Now, however, the totalitarian system in China means that many people in China are ignorant about the proper status of Tibet. Nevertheless, as Chinese study and travel abroad they have greater opportunities to learn. Taking up the booklet containing the text to be taught and others in Tibetan, Hindi and English, which had been distributed to the audience, His Holiness asked them to turn to the ‘Praise to the 17 Nalanda Masters’. He then read through it, commenting on the verses as he saw fit. The Praise begins with a celebration of the Buddha, then Nagarjuna. Although he lived long ago, we can still see his qualities in the writings that have come down to us, such as the Six Collections of Reason. There are 16 volumes of Perfection of Wisdom teachings in the Kangyur and Nagarjuna illuminated their explicit import—emptiness. Maitreya, who may have been a human being or a deity, explained their implicit meaning. His Holiness remarked on the importance of distinguishing history from mysticism, observing that while there is a story that when he died Songtsen Gampo dissolved into a statue of Avalokiteshvara, there is also something referred to as his tomb. The praise goes on to laud Nagarjuna’s followers—Aryadeva, Buddhapalita, Bhavaviveka and Chandrakirti, all of whom contribute to our understanding of wisdom. Shantideva, meanwhile, in his ‘Compendium of Training’ and ‘Guide to the Bodhisattva’s Way of Life’, gave a thorough account of how to deal with anger and hatred and generate the awakening mind of bodhichitta. Shantarakshita and Kamalashila, great masters of philosophy and logic were responsible for establishing the Nalanda Tradition in Tibet. Asanga was the founder of the Mind Only School, while his brother Vasubandhu wrote extensively on Higher Knowledge (Abhidharma). Dignaga and Dharmakirti are renowned for their work on the use of logic and reason. The Tibetan tradition of debate derives from these two masters, with contributions from Sakya Pandita and Chapa Chökyi Sengey. Vimuktisena, a student of Vasubandhu, challenged his teacher’s interpretation of the view when he adopted Madhyamaka in place of the Mind Only School. The Praise goes on to admire Haribhadra, a prominent commentator on Maitreya’s ‘Ornament of Clear Realization’, the Vinaya masters, Gunaprabha and Shakyaprabha and finally the great 11th century synthesizer of these various traditions, Dipankara Atisha. At the present time, when in the ordinary world there is great advancement in the fields of science and technology, but we are also distracted by the hustle and bustle of our busy lives, it is extremely important that those of us who follow the Buddha should have faith based on knowledge of his teaching. His Holiness began his reading of Tsongkhapa’s ‘Concise Stages of the Path’ with an introduction to the author. Tsongkhapa was born, grew up and began his studies in Amdo. At the age of 16 or 17 he left for Central Tibet where he studied in all the existing centres of learning. He received many teachings from the Sakyapa Rendawa as well as Drikung and Nyingma masters. In his memoir, ‘Destiny Fulfilled’, he declares that he was never satisfied with only partial study. In addition to his works on the Stages of the Path, he composed five treatises on Madhyamaka view. I, a yogi, practised in this way. You, who seek liberation, should do likewise. And I, who seek liberation, will do likewise. Verses 17 & 18 complete the advice for the person of initial capacity, while verses 19 & 20 relate to the person on medium capacity and verses 21 & 22 introduce ‘Bodhichitta as the central pillar of the path of the supreme vehicle’ and begin the explanation of the path of a person of great capacity. Subsequent pairs of verses discuss the practice of the six perfections: generosity, ethics, patience, effort, concentration and wisdom that understands the way things really are. The subsequent triple verse describes the impact of a combination of a powerful calmly abiding mind with the sharp insight of wisdom. Verses 40 & 41refer to the space-like emptiness experienced in meditation and the emptiness of illusion-like appearances you see when you arise from meditation. This unifies skilful means and wisdom, which is praised as inspiring the transcendent deeds of Bodhisattvas. The final advice in verses 42 & 43 mentions the common requirement for entering into the causal and resultant paths of the Great Vehicle. On that basis you should embark on the high seas of the classes of tantra, and by following the complete oral instructions, you make your free and fortunate life meaningful. His Holiness concluded today’s teaching with the announcement that he will give an empowerment of the Great Compassionate One, Avalokiteshvara tomorrow. This will be followed by a Ritual to Request that His Holiness live long.